One of the things kids need to learn in order to become responsible adults is to earn, save, and spend money. Roxy and the Ballerina Robot helps them learn about financial responsibility with an engaging story about a young girl tackling modern life with her fun-loving family. In Roxy and the Ballerina Robot, Roxy is an energetic young girl who dreams of owning a sweet, new, expensive toy called the Ballerina Robot. Her dad suggests that she saves up so she can buy the toy, but she can't seem to stop spending money on other, less important things. The book deals with her struggles and eventual success to reach her goal. Featuring 28 beautifully illustrated pages, Roxy and the Ballerina Robot is engaging for the whole family. It offers two reading options: "Read to Me" with narration and text highlighting in three languages (English, Spanish, or French), and "Read by Myself". Both modes also allow kids to tap on a word to hear it said out loud. Navigating the app is easy. Kids simply swipe to bring up the next paragraph or move to the next page. A menu button on the top left allows kids to quickly jump to a page in the book, and change the reading mode or language. Parents need to know that Roxy and the Ballerina Robot is a safe app for kids. It has no ads and no in-app purchases, and it doesn't require an Internet connection. A secured section for parents contains developer information and links to social media. There is a link to rate the app at the end of the story, but it's also protected with a parental lock. The app is suitable for kids between ages 6-8. Though non-readers can simply use the narrated reading mode, it should be noted that the narrator talks rather quickly. Fortunately, kids can tap on a word to hear it said out loud. Roxy and the Ballerina Robot is fantastic. It's not only entertaining, but also filled with valuable lessons on saving money and working towards your goal. The characters are presented in a realistic way, which allows kids to identify with their struggles, and apply the lessons they learn in their own lives. In addition to teaching kids about self-restraint, the story also promotes family values. Everyone in Roxy's family treat each other respectfully, say "thank you" and "sorry" at appropriate times, and support each other in their quest to better themselves. My only critic is that the parents look about the same age as Roxy in the illustrations, but it is a minor issue that doesn't take away from the story's wonderful message. Roxy's family members keep each other's emotions in check. 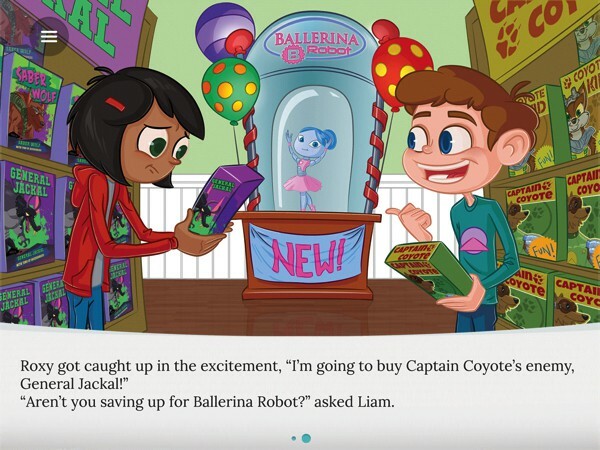 Roxy and the Ballerina Robot is a must-have for parents who want to teach their kids the importance of saving money. This book app features an engaging story with great lessons, and is accessible by fluent and beginning readers alike. While it doesn't offer much in terms of interactivity, it does have vibrant illustrations and likable characters. Highly recommended!